It was the early 1990s, and the University of Toronto was seriously considering pulling the plug on their football program. But then, Adam Zimmerman stepped in. As one of the founding members of the Friends of Football group, now known as the Blues Football Alumni Network (BFAN), Zimmerman used his business expertise and advocacy skills to keep U of T football alive. The Varsity Blues, riding on the high of being able to continue on with the Friends of Football’s financial and moral support, proceeded to win the 1993 Vanier Cup – the same year the school scrapped the program’s closure plans. It’s for this reason, and for the plethora of his other accomplishments, that Zimmerman was posthumously awarded the L.B. 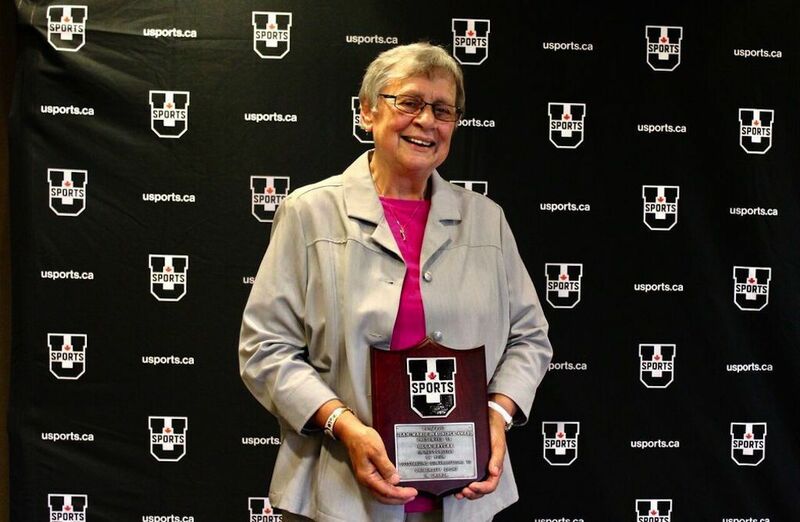 “Mike” Pearson Award at the U SPORTS Awards Gala on June 7. 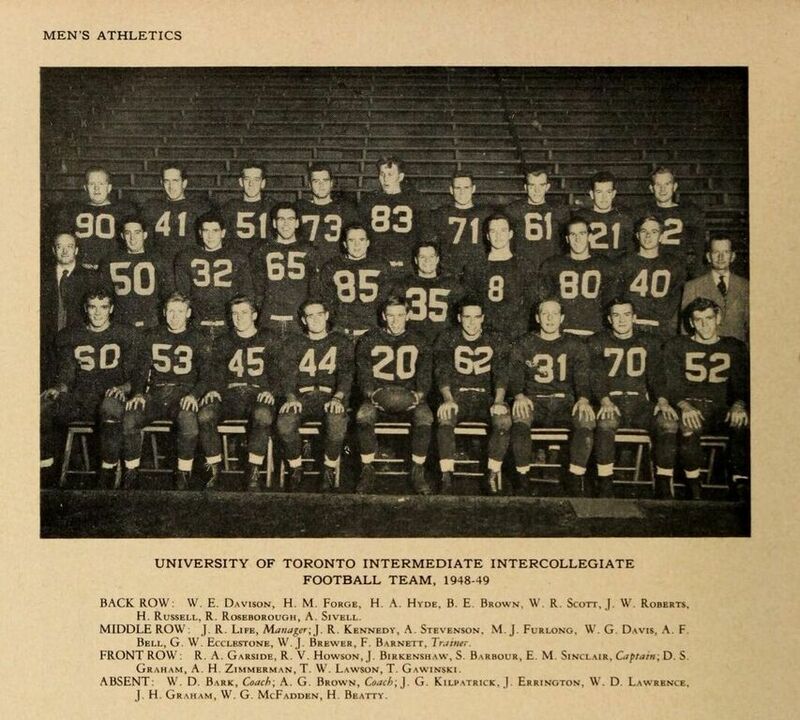 Prior to his work to save and help fund U of T football, Zimmerman was a player himself. He began his love for the game playing in high school and then for the Varsity Blues in the late 1940s. Off the field, Zimmerman earned a philosophy degree in 1949. He later became a chartered accountant before joining the team at Noranda Mines, a Canadian mining and forestry company. During his years with the organization, Zimmerman worked his way up the executive ladder, eventually becoming president and vice chairman. While at Noranda, Zimmerman helped the company implement the takeover of MacMillan Bloedel, an ordeal dubbed the largest corporate acquisition in Canadian history at the time. Aside from his career leading Noranda where retired from in 1994, Zimmerman managed to create a diverse and impressive resume. He held 41 directorships throughout North America and Europe including the Hospital for Sick Children, was the founder of the University of Northern British Columbia (UNBC), and an Officer of the Order of Canada—to name a few of his great accomplishments. 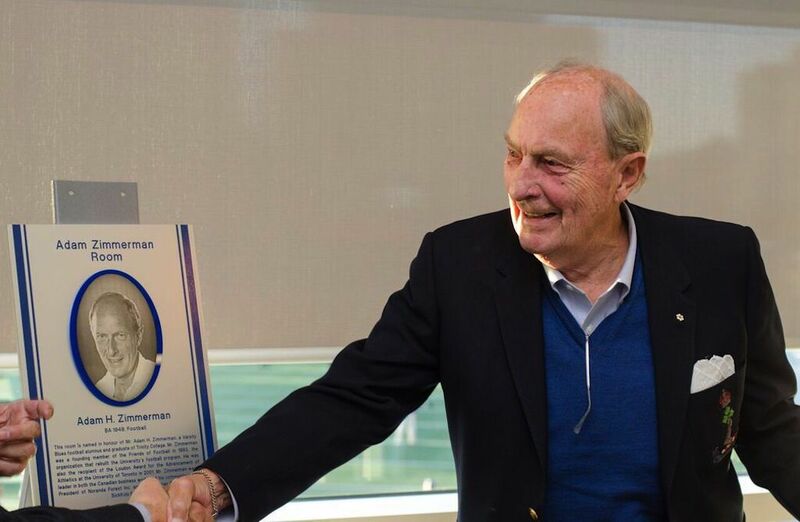 “We are reminded of him every time we walk into the Zimmerman Room and see his picture on the wall,” said Beth Ali, U of T executive director of athletics and physical activity, during the presentation of the L.B. “Mike” Pearson Award. “His spirit lives on in our hearts and minds.” Coach Gary adds that he hopes Zimmerman’s legacy will go even beyond memories and beyond the Adam Zimmerman Room. He hopes that Zimmerman’s reputation of serving the community that built him is something that his players will emulate.